Conceit has something to prove! This is more than obvious when you get the chance to see him perform. The energy and passion he displays on stage is only complimented by the creativity and appeal of his music. During a time when hip hop has either gotten to preachy or much too ignorant, Conceit has the ability to mix all that’s good with all that’s hood and give the crowd a show to remember! Growing up in Jersey City, N.J. as an eighty’s baby, Conceit was exposed to the true roots of hip hop at an early age. Influenced by Mc’s such as Rakim, Nas, Big Daddy Kane, and Jay-Z as well as groups like Pubic Enemy and A Tribe Called Quest, he learned to respect the art of putting words together not just to rhyme, but to express oneself. Living in places such as: Atlanta, Texas, and California have also had a strong impact on Conceits music. He blends his lyrical abilities with the bounce and party feel of down south and west coast hip hop, a pleasure to behold! Conceit has shared the stage with Major artist such as The Ying Yang Twins, E-40, Too Short, Twista, Bone Thugs in Harmony, Dj Unk, Paul Wall, Chamillionaire and Mistah F.A.B. After every show the fans are talking about much more than just the Major artist! 07/05/11 marked the release of Conceit third album titled “PERFECTION”. 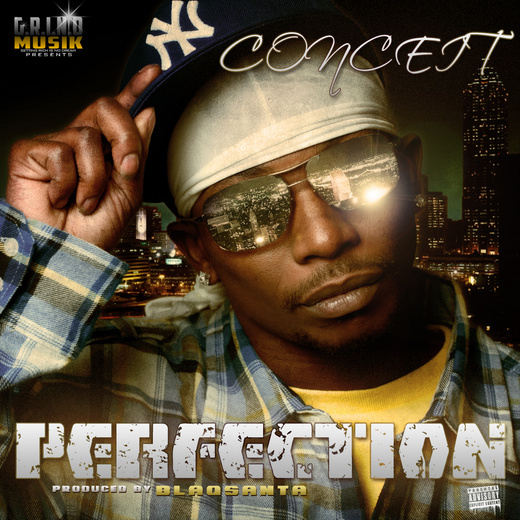 This CD is Conceit’s first with major backing and distribution and is expected to turn a lot of heads. His first two albums “Classic” (may08) and “I Shall Be Heard” (apr09) were both released with limited availability but will one day be seen as diamonds in the ruff… It was once said that hip hop is dead, well Conceit looks pretty good for a dead guy because he is hip hop. If u enjoy good music in general (not just rap) you should keep an ear out for this kid. He is destined for great things!